After my Caturday post I had a few comments about my tattoo so I thought I’d share proper pics. 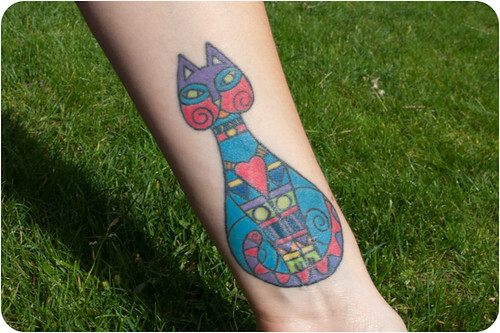 I found a similar shaped outline on my search for a cat design and then adapted it and added lots of colour. I wanted something super colourful to signify the effect cats have had on my life. It probably sounds crazy to non-cat people but my life totally changed when I got Pixie, she brough so much happiness and light into my life and rescued me from a really dark place. The tattoo covers some of the scars from that horrible time in my life. It’s not just how Pixie cheered me up that she changed my life. If it weren’t for my cats I wouldn’t have got into photography in such a big way and I wouldn’t have taken the huge step of moving to a city to do a degree. If I hadn’t got into photography I would never have met Daz. I can’t imagine how my life would have turned out without cats. I have plans for more tattoos one day (sorry mum, if you’re reading this) still working on ideas for now. 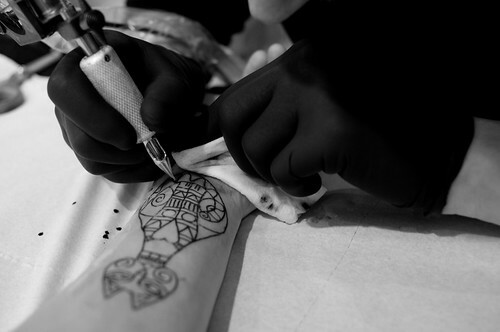 I found these old photos on my Flickr of me getting it done. Aw, thanks for sharing the pics & story! You’re so talented..I can’t wait to see what you come up with next! Absolutely beautiful! You are so talented and I too, am a crazy cat lady and love it! 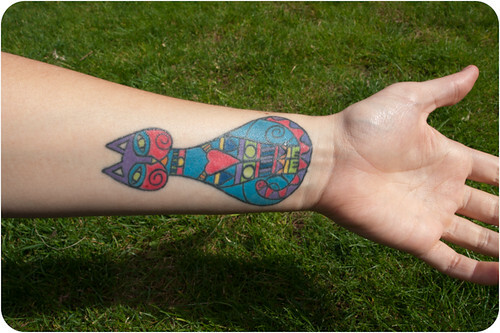 Great tattoo – almost Laurel Burch-like. I particularly like heart and the vibrant colours which, from your story, seem like a reflection of the thought you put into your design.